In the last years of his life, Harry Houdini became, to borrow the title from one of his books, "A Magician among the Spirits." As the most famous illusionist in the world, Houdini was naturally drawn into the great debate over Spiritualism in the wake of World War I, eventually becoming one of its most vocal opponents. At first Houdini was drawn to Spiritualism out of genuine curiosity, as well as out of his friendship with Sir Arthur Conan Doyle, a fervent believer. Houdini suspected that the secret of their craft lay not in any mystical connection with the spirit world, but in clever trickery. And after sitting with more than a hundred mediums, he was sure of it. As he told an interviewer from the Los Angeles Times, "It takes a flimflammer to catch a flimflammer." With characteristic tenacity, he set out to expose as many mediums as he could. Houdini’s longest and most publicized confrontation with a spirit medium began in 1924, when he took on a formidable Boston woman named Mina Crandon, known publicly as "Margery." The thirty-six-year-old wife of a prominent Boston surgeon, Crandon was the most serious contender for a $2,500 prize offered by "Scientific American" magazine to the first medium who could produce "conclusive psychic manifestations" under test conditions. That such a contest was sponsored by a venerable publication is evidence that "psychical" research was considered a legitimate area of scientific inquiry at the time. 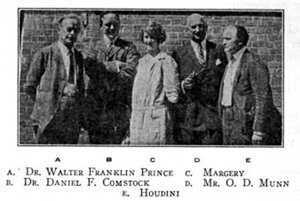 Houdini, always eager to be seen as more than a mere entertainer, was delighted to join the investigative committee, which included some of the world’s most distinguished psychical researchers. With the "Scientific American" committee taking months to issue a definitive statement on the case, Houdini published the following pamphlet at his own expense in November, fully expecting it to settle the matter once and for all. To his great disappointment, it did not. In January, 1925 Houdini staged a dramatic exposé at Boston’s Symphony Hall, with the Crandon’s replying with their own presentation days later at Jordan Hall. Only in February, when the Crandons declined any further tests or encounters with Houdini, did the committee vote to deny her the prize. Ironically, "Margery’s" final unmasking did not come at the hands of the world-famous Houdini at all, but by a Harvard graduate student in pychology later that spring. Still, Houdini had come out on top: by the end of the year his career peaked with a one-man show on Broadway. The show’s final act, "Do the Dead Come Back," featured "The Elusive American" at his medium-busting best. In order that the reader may thoroughly understand my relation to the "Margery" case and the "Scientific American," and to make this record as complete and clear as possible, I will first review briefly my connection with that magazine's investigation of so-called psychic phenomena. Something like three years ago I was asked to write a series of articles on Spiritualism for the "Scientific American" but had to refuse owing pressure of work. 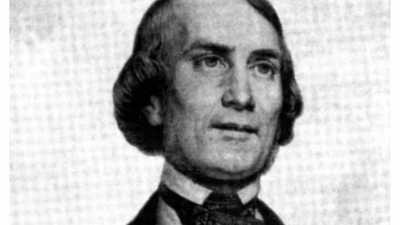 Later a Mr. James Black furnished the magazine with a number of articles which were published, but these were so inaccurate that they were assailed, and justly so, from all sides. Having thus stirred up a hornets' nest and not having a sufficient knowledge of Spiritualism to meet the situation, one of the oldest editors on the "Scientific American," and my friend for over a quarter of a century, Mr. A.A. Hopkins, wrote me again, urging that I prepare some articles on Spiritualism for them. The letter was followed very soon by a call from Mr. Hopkins who came to my office in New York bringing with him a tall man whom he introduced as J. Malcolm Bird, also a member of the "Scientific American's" editorial staff. They discussed the Black articles with me and asked why it was that I would not write on Spiritualism for them. I explained that the research work involved was such that I could not entrust it to anyone else and that it was impossible for me to spare the time which this and the writing of the articles would require, but I advised them to form an investigating committee and said if the other members were honest, reliable, and qualified, I would serve as one without pay with the stipulation that I was to have the right to reject any person proposed as a member of the committee with me. My reason for this was, as I explained to them, that while an ordinary investigator, whether layman, professor, or scientist, could make a mistake and later correct himself without damage to his standing, I was in a different position, for due to the peculiar nature of my work my reputation was at stake and I could not run the risk of having it injured. This was agreed to before they left my office, but sometime, afterwards hearing that they had selected a committee without consulting me I wrote the following letter to protect myself. I have just been informed by Mr. Hopkins that you have already selected a committee to serve as investigators for the $5,000.00 offered to the mediums. I am to know each and every man selected. That all conditions placed before the mediums should be thoroughly gone over with me, so that there could be no loophole for anyone to misconstrue the conditions of the manifestations required. Another condition is that the selected committee will go to a number of séances for investigation purposes, so that we could get a line on each other regarding the capability of actually recording in writing what was seen, as mal-observation is the curse of all description. It was also stipulated in my condition that we are to hold conferences to see whether all the committee are agreeable to each other, because we must work in harmony. I have more at stake than the money you are offering and that is my reputation. As a psychic investigator, and I, therefore, ask you to give me your full confidence, as I am giving you mine. I intend to serve you faithfully, and with all the knowledge I possess, but I ask to be fully protected in this. May I suggest that it might be advisable for us to get together again before publicity is given, so as to prevent any mistakes on all our parts. I am keenly and intensely interested in the subject and will deem it a compliment to be on the committee, but if any of the above conditions do not meet with your approval, please count me out. The Committee as finally formed consisted of Dr. William McDougall, af Harvard University; Dr. Daniel F. Comstock, formerly of the Massachusetts Institute of Technology; Dr. Walter Franklin Prince, of the Society for Psychical Research; Hereward Carrington; and Houdini. Mr. Bird acted as Secretary for the Committee and Dr. Austin C. Lescaboura, another editor on the "Scientific American" staff, has assisted in arranging the tests and been present at most of the séances. Following the "Scientific American's" offer of a sum of money as a prize to any medium who could successfully pass its tests, several presented themselves and gave sittings before the Committee. Among them were the Tomsons, Mrs. Josie Stewart, Valentine, and Pecararo. Bird did not invite me to the major part of the séances, whereas, as Secretary, it was his duty to do so, therefore, on learning of the Pecararo tests, I traveled from Little Rock, Arkansas, to New York, to be present at one of the Pecararo séances. In all these investigations it would seem that Mr. Bird allowed the mediums to believe that they had practically won the prize and this is mirrored in the press reports given out by him. Dr. Prince and I strenuously objected to this course. So far as I knew there was no other investigation under way when, on picking up a copy of the "Scientific American" early in 1924, I was surprised to find an announcement of a series of séances being held by the Committee with a certain "Margery" and judged from the reading of it that the Committee was on the verge of awarding her the prize. In the next issue of the magazine I again found mention of the mysterious medium whose identity was being hidden behind the name of "Margery," but as most all American papers carried stories giving her correct name and address before I was called into the séances, and as later she gave interviews to newspaper men, and one in particular in my presence, without denying her name, it would be ridiculous for me now to do other than call her by her right name also, Mina Crandon, wife of L.R.G. Crandon, a well-known Boston surgeon. The "Scientific American" reports, written by Editor Bird, were such as to lead an ordinary layman to believe that the magazine had found a medium who had successfully passed all its crucial tests and to all intents and purposes was "genuine." In addition the lay reader, and the uninitiated reporter as well, were left with the impression that the Committee had approved this medium, whereas the articles only represented the opinion of Mr. Bird, who, garbing himself in a mantle of authority, had written whatever he desired, always, however, being careful to so phrase his material that later, in case the necessity arose, he could claim a certain alibi. A careful reading of the articles makes these subtleties obvious. These articles, written by Bird, are the worse piffle I ever read, paralleled only by the tommy-rot written about Mrs. Guppy, who was said to have been floated through the air, plate-glass window, and solid brick. Bird represented the medium as not only doing the ordinary table tilting, lifting and communicating by means of a code of raps common among all mediums, but in addition, such stunts as stopping and starting clocks, tipping over the cabinet, having furniture moved around the room before the observers in full light and with no visible means of accomplishing it. Spirits whistling a tune, using a megaphone, and sending a curtain rod sailing around the room. They also claimed the transportation of a live pigeon through solid matter. They are fulsome, gushing reports of nothing, and to intimate that a live pigeon had been brought into the room from the outside, passing through glass or brick without making or leaving an aperture, is doing something which a magazine with such a reputation for conservativeness and accuracy as the "Scientific American" should avoid, even though the idea is covered. As you will observe when you get your July "Scientific American," we are engaged in the investigation of another case of mediumship. Our original idea was not to bother you with it unless, and until, it got to a stage where there seemed serious prospects that it was either genuine, or a type of fraud which our other Committeemen could not deal with. Regardless of whether it turns out good or bad, there will be several extremely interesting stories in it for the "Scientific American" and these will run in the August and following issues. Mr. Munn feels that the case has taken a turn which makes it desirable for us to discuss it with you. Won't you run in, at your convenience, to take lunch with one or both of us, and have a talk with Mr. Munn? Better call me in advance, and make sure that he and I will be in at the time you select. P.S. Mr. Munn left the office today, to be gone until Monday morning. "Do you believe this medium is genuine?" "Why, yes, she is genuine. She does resort to trickery at times, but I believe she is fifty or sixty percent genuine." "Then you mean that this medium will be entitled to get the "Scientific American "prize?" I asked. "Mr. Bird," I replied, "you have nothing to lose but your position and very likely you can readily get another if you are wring, but if I am wrong it will mean the loss of reputation and as I have been selected to be one of the Committee I do not think it will be fair for you to give this medium that award unless I am permitted to go up the Boston and investigate her claims, and from what you tell me I am certain that this medium is either the most wonderful in the world or else a very clever deceptionist. If she is a fraudulent medium I will guarantee to expose her and if she is genuine I will come back and be one of her most strenuous supporters." "If you give this award to a medium without the strictest examination every fraudulent medium in the world will take advantage of it. I will forfeit a thousand dollars if I do not detect her if she resorts to trickery. Of course if she is genuine there is nothing to expose, but if the "Scientific American" by any accident should declare her genuine and she was eventually detected in fraud we would be the laughing stock of the world, and in the meantime hundreds of fraudulent mediums would have taken advantage of the error." "Well then you and I will go up together and see," he replied. "All right, I am at your service," I told him. 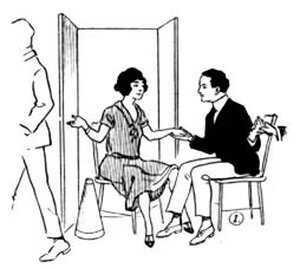 This was the condition of affairs on July 23, 1924, when Mr. O.D. Munn and I reached Boston, where Bird had preceded us by auto and was the guest of the medium and her husband, as he had been previously for weeks at a stretch, at times accompanied by Mrs. Bird and at other times alone. Carrington had also spent a number of weeks in the family, but, although we had dinner with the Crandons, Mr. O.D. Munn and I stopped at a hotel, for I agree fully with Dr. Prince that it is not possible to stop at one's house, break bread with him frequently, then investigate him and render an impartial verdict. We were given to understand that this first séance which I attended on the evening of Wednesday, July 23rd, was the forty-eighth in which Mrs. Crandon had been tested, but I learned later from a letter written by her husband that it was nearer the eightieth, and by the time Mr. O.D. Munn and I had finished our fifth séance Dr. Crandon claimed that the total was ninety. All séances were dark. At this séance Dr. Crandon sat on the medium's right and held her right hand and J. Malcolm Bird, as had been customary in their previous séances, circled with one of his hands the fingers of both the medium and her husband. This left one of Bird's hands free for "exploring purposes" as he said. I sat on the left of Mrs. Crandon and held her left hand with my right. My right foot was placed against her left foot, pressing against her ankle. Anticipating the sort of work I would have to do in detecting the movements of her foot I had rolled my right trouser leg up above my knee. All that day I had worn a silk rubber bandage around that leg just below the knee. By night the part of the leg below the bandage had become swollen and painfully tender, thus giving me a much keener sense of feeling and making it easier to notice the slightest sliding of Mrs. Crandon's ankle or flexing of her muscles. She wore silk stockings and during the séance had her skirts pulled well up above her knees. One of the successful demonstrations which she had been giving and which none of the Committee had been able to expose, involved the use of an electric bell enclosed in a box fourteen inches long by six wide and five deep. This box was stoutly fastened on all sides except the top which was covered with boards. Inside the box with the bell were dry batteries which rang it whenever a certain pressure at the top of the box completed the circuit. In previous séances when this box had been placed in front of Mrs. Crandon and the sitters supposed they had her perfectly controlled (held hands and feet so they could detect any motion) the bell had been rung repeatedly and the explanation given was that "Walter," the medium's dead brother, had closed the circuit. Not only had the bell been rung but it had been used with a code and answered questions. "Just press hard against my ankle so you can see that my ankle is there," and as she pressed I could feel her gain another half inch. When she had finally maneuvered her foot around to a point where she could get at the top of the box the bell ringing began and I positively felt the tendons of her leg flex and tighten as she repeatedly touched the ringing apparatus. There is no question in my mind about it. She did this. Then, when the ringing was over, I plainly felt her leg slide back into its original position with her foot on the floor beside mine. During the second intermission "Walter" asked for an illuminated plaque to be placed on the lid of the box which held the bell and Bird went to get it. This left the right hand and foot of the medium free. Bird had difficulty in finding the plaque and while he was searching "Walter" suddenly called for "control." "You have now both hands and both feet." "The megaphone is in the air. Have Houdini tell me where to throw it." "Toward me," I replied, and in an instant it fell at my feet. The way she did these two tricks is as follows: when Bird left the room it freed her right foot and hand. With her right hand she tilted the corner of the cabinet enough to get her free foot under it, then picking up the megaphone she placed it on her head, dunce-cap fashion. Then she threw the cabinet over with her right foot. As she did so I distinctly felt her body give and sway as though she had made a vigorous lunge. As soon as this was done "Walter" called for "better control" and she gave me her right foot. Then she simply jerked her head, causing the megaphone to fall at my feet. Of course with the megaphone on her head it was easy and simple for her to ask me or anyone else to hold both of her feet and also her hands, and still she could snap the megaphone off her head in any direction requested. This is the "slickest" ruse I have ever detected, and it has converted all skeptics. The next day Mrs. Crandon told us it would be impossible to either kick or push the cabinet over as it was hinged on the inside and would double up in the middle, but that afternoon Mr. O.D. Munn and I went upstairs alone and while sitting in the medium's chair I put my right foot under the right-hand corner of the cabinet and easily tilted it so that the slightest movement caused it to fall over. The second séance of Mrs. Crandon's which I attended was on the evening of July 24th, at Professor Comstock's hotel. At this time I discovered without question that she used her head and shoulders to push back the table. Her great asset in disguising the muscular movements which she uses in doing this is the arm chair in which she sits. 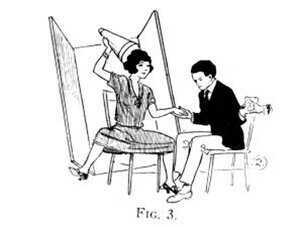 As she is unusually strong and has an athletic body she can press her wrists so firmly on the arms of the chair that she can move her body and sway it at will without the sitters, who have hold of her hands, detecting the movement. That evening I was in charge of her left hand which rested lightly on the palm of my right. With my index finger I could feel her pulse. In fact I used the secret system of the "touch and tactics" of the mind or muscle performer, (I had given performances or tests in this field of mystery) who is guided by the slightest muscular indication in finding a hidden article. I was able to detect almost every time she made a move. Frequently she stretched out her arms to rest them and once I caught her using this motion as a subterfuge, leaving only her elbow on the chair while she pushed the table with her head. "Walter," her guide and aide, is very autocratic, seldom asking anything but usually directing, and this evening he ordered everyone to move back from the table around which we were sitting so that he might gather force. This was simply another ruse on the medium's part, for when all the rest moved back she moved back also and this gave her room enough to bend her head and push the table up and over. I caught her doing this twice. Before going to the séance Mr. O.D. Munn and I had determined to explore things to our satisfaction and had arranged a code of signals. At the séance he sat at my left in the circle, I holding his right hand. 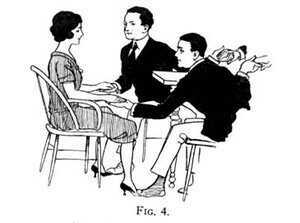 At the first movement of the table I pushed his hand under it and let go and began groping around with my left hand. As I did so I felt Mrs. Crandon's head at the edge of the table pushing it up and forward until the box with the bell had slipped off to the floor. I reached over and whispered to Mr. O.D. Munn what I had detected. Then to check up and assure myself of the deception I reached out again into the dark and she ran her head directly against my outstretched fingers. I do not think she was more surprised than I. She then said something about losing hairpins and after the séance her hair was loosened. This was done for effect and to offset my discovery. "Will I denounce and expose her now?" "You had better wait a while," he replied. "Now is the time," I urged. "No, better not for a while," he answered. "You have garters on, haven't you?" "Well, the buckle hurts me," she said. I reached down to undo the garter and found that the buckle had caught her stocking so fast that it prevented her from sliding her ankle enough to get room to tap the bell. After I took the garter off she was able to reach the bell as she had the previous night. When the spirit asked Mr. O.D. Munn how many times he wanted the bell rung and Mr. Munn said "five," she made so bold a sliding movement with her ankle to reach the box that I think she was under the impression that I was badly fooled or was going to help her like others. After the five taps on the bell she slid her foot back into position on the floor beside mine. "We will do it different this time." I strongly suspected his motives and told Mr. O.D. Munn so after we had left. Jack London and Harry Houdini quickly became friends when they met in 1915. But on that day, they would have been shocked to know what their future held: London would soon be dead, and not long after Houdini would carry on an affair with his widow.